If you start with a blank report, add all the data sources you need by choosing the “Add Data Source” menu item on the report designer. 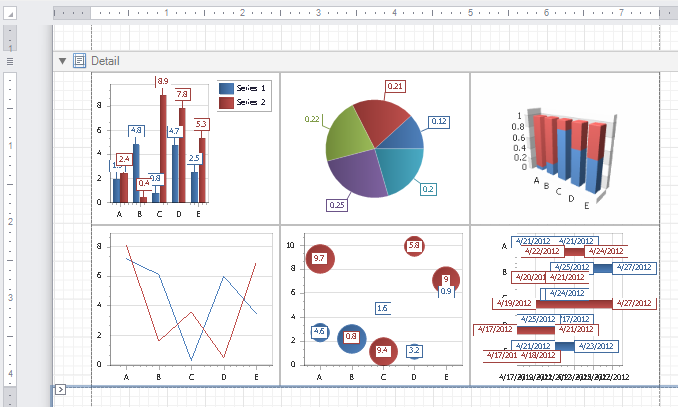 Then add one or more chart controls onto the report. Click on the chart smart tag on the top right if each chart and select the Data Source, Data Member, and Data Adapter. Do this for each chart. Run the chart wizard now to setup the chart. Arrange the charts so the report appears like a dashboard. You are now ready to go. Your dashboard can include pivot tables as well as subreports. There is no limit to the formatting options. Then set it up to output in all kinds of different file formats and be sent to a website, FTP site, emailed, or other output option. Note: For a even more powerful Dashboard solution, check out CleverQ. This product actually includes a version of Sunset Reports built-in. A big trend in business these days is looking at dashboards and gauges that measure business metrics. Key Performance Indicators (KPI) are a typical type of value that is shown on the dashboard. You can use Sunset Reports to create reports with multiple charts on the same page and also include pivot tables with KPI graphics. But we have to mention another product called CleverQ, which is much better setup for dashboards and gauges. We also have to mention that a version of Sunset Reports is built into this product as it’s report manager. But CleverQ goes beyond reports, it contains analytical tools, seasonal trend analysis, forecasting, gauges, advice, drilldown capabilities, data extraction, and more. So if you need any of these features, check out http://www.cleverq.com/.